April is Distracted Driving Awareness Month. The problem is huge: 92% of drivers admit to using their phone while driving (phonecalls, navigation apps, etc) and a 71% admit to texting while driving. Distracted driving does not just put other motorists at risk; it also puts pedestrians, skaters, bicyclists and anyone else sharing the road at risk. 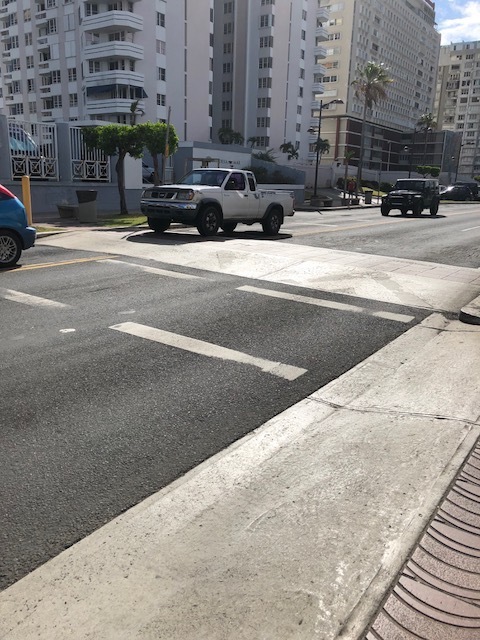 On a recent trip to Puerto Rico, we saw a unique approach to help improve pedestrian safety. According to the Centers for Disease Control and Prevention, the majority of pedestrian deaths occur at non-intersections and in urban areas, and this makes perfect sense. Urban areas are more densely populated and people often choose to walk to nearby amenities. A resident of the Gulch in Nashville will not think twice about walking a short distance to a restaurant on Lower Broadway, but a resident in Franklin County is unlikely to walk 14 miles to the Kroger. As for non-intersections being more dangerous, this is often a product of speed as many drivers tend to speed on open straightaways. Likewise, drivers are more apt to look for pedestrians at intersections but not as much on straightaways. 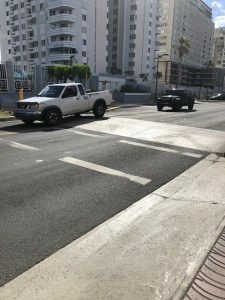 So back to Puerto Rico’s approach to pedestrian safety. 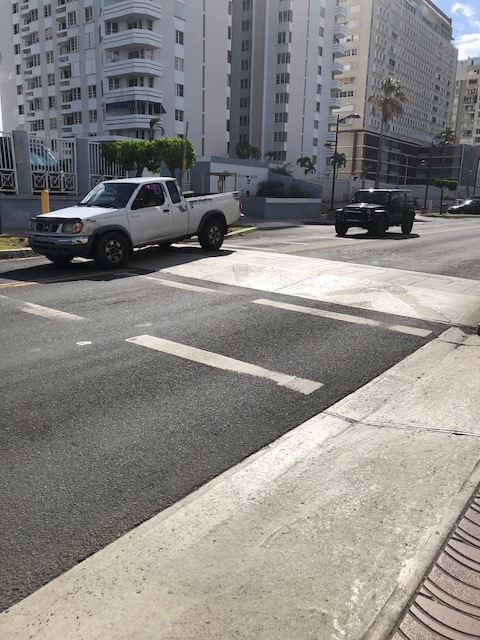 In non-intersection, urban areas in San Juan, Puerto Rico raises the crosswalk, which serves two purposes. First, it elevates pedestrians making them even more visible to drivers. But more importantly, it requires drivers to slow down or else bottom out their vehicle. The photos above show vehicles slowing down to cross over the raised crosswalks. Quite frankly, the design could be further improved with some reflective paint. But, in our observations, drivers definitely slowed down considerably as they navigated over the raised pedestrian crosswalks, and the statistics suggest the elevated crosswalks help. Significantly, these numbers do not include pedestrian accidents that occur in parking lots or private property, and parking lots are a very common site of pedestrian accidents including back over accidents. By contrast, according to a 2017 report, pedestrian accidents in Puerto Rico are declining. To be sure, reducing pedestrian accidents and deaths is a complicated problem, and we are not suggesting these crosswalks would be the magic bullet but it could be a useful arrow in the Tennessee Department of Safety’s quiver. So as the weather here in Nashville, Murfreesboro and all of Middle Tennessee continues to improve, more folks will choose to walk, ride their bikes, roller blade etc. As you drive, slow down. Put down your phone and be on the lookout for others sharing the roadway. Of course, for more information on pedestrian accident, visit our website at www.johndaylegal.com/pedestrian-accidents. If you or a loved one is injured as a pedestrian, bicyclist or motorist, give us a call. We offer a free, no-obligation consultation in which we will answer your questions and let you know if we think you have a case. If we think we can help and you decide to hire us, we handle all accident cases on a contingency basis, so we only get paid if we win. To get started, call us at 615-742-4880 (Nashville) or 615-867-9900 (Murfreesboro) or 866-812-8787 (toll-free).